Yesterday, was the first day that it felt like this long winter may actually come to an end. The sun was shining, and my dreary mood was immediately lifted. It has been the strangest winter, not necessarily cold, but very wet and hazy. Like Forks, without Edward, I guess (still a little Twilight obsessed here). I opened up all of our blinds and let the sun shine in. It felt like spring, even though it’s still technically winter, and not warm in the least. The sunshine was nice, but I felt like we needed just a little something more. Fresh flowers…and a little green, please. So, Kate and I headed to Trader Joe’s to see if we could spring it up a bit in here. TJ’s did not dissapoint, as usual. They had loads of fresh spring flowers in all shades of springy goodness. My favorite flowers are tulips, so I immediately gravitated towards them. I bought two bouquets in red, and placed them in a white canister that lost its lid long ago. Don’t they look dreamy? Kate loved the daffodils, so we bought two bunches of them for less than $2 and placed them in a mason jar in my craft nook. I removed my ivy topiary (the other one didn’t make it) from the sap bucket it was in before, and moved it to a white urn. Doesn’t the green just pop out of the white urn? I am so in love with the green…it just makes the room feel alive. Can you tell that I have a slight lemon button fern obsession? I buy every one I see…I just love them! Strangely, I can’t find them many places, and as much as I don’t love Walmart, they usually have the small ones. Anyhoooo…I’ve had this one for a few years, and it is still in it’s original container, wrapped with burlap, nestled in a white ironstone pedestal. 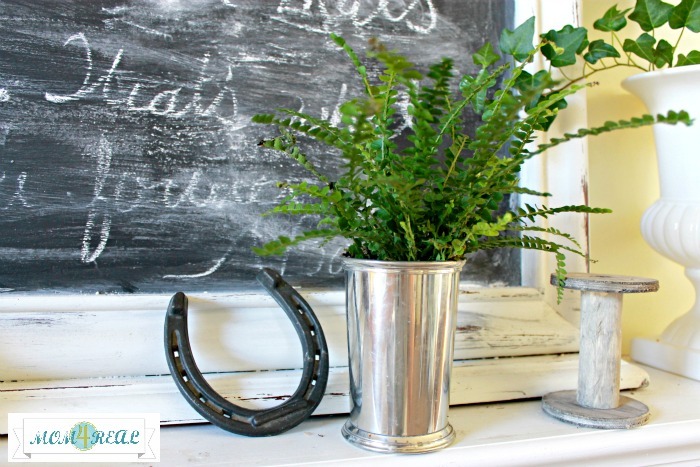 And of course…for this Kentucky girl, a little lemon button fern I picked up over the weekend, planted in a mint julep cup…just perfect for the Kentucky Derby! There is nothing like Spring flowers to brighten up a cold dreary day…! !…love the way you have beautifully placed them throughout your home!…Have a great day Jessica! Thank you, Shirley! They really do make it feel a little more springy. Now I want to go find me some tulips!! Get er done girl! You should have plenty of ferns! I so need to get better with the wreaths! TJ’s sure makes buying fresh flowers easy and cheap! Love the flowers! Makes me ready for spring! Not too much longer girly! We should hit Keeneland together for sure! Tulips are my favorite too and I love all the touches of green! SO pretty! Thanks, Keri! I just wish they lasted a little longer! No shame in that! I have fake geraniums in my breakfast nook, because they are the one flower that I totally love, but kill every single time. Thanks for sharing LOVE the tulips ! Thank you…they are my absolute favorite! Oh I love it too Jessica….tulips make me smile. I just wish they lasted longer. So pretty! Tulips are my fave. Come on, spring!! I know…it’s been such a long winter…not too much longer!!! flowers, flowers everywhere!! They are beautiful & sure do brighten up the room! I can’t live without them…I need a greenhouse for sure! Oh I love your tulips…especially the white ones. They are my favorite. I think flowers bring a room to life…they just add that extra touch! Don’t they? I wish I had a sun room so I could fill it full of them year round! Oh my! Your fresh flowers are like a breath of fresh air! It has been cold and dreary here TOO many days, and I think you have the perfect remedy! I will have to look for the lemon button ferns! Thanks, Jane! Those lemon button ferns are my favorite…just so sweet and delicate. So so pretty!! I need to get some live plants in here! Can’t wait for the farmer’s market to open! I love our farmer’s market! We are going to have a blast down there! Thursday night live too…have you been? How pretty! 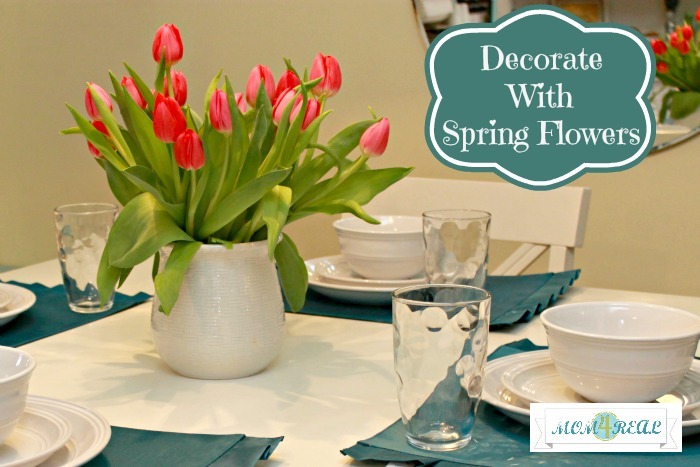 I love to decorate with flowers too, especially in the spring! There’s just nothing that freshens up a room as much as fresh flowers! I love those daffodils, they are beautiful! Thank you! They were only $1.25 a bunch…super cheap, and I love the smell! I am dying to have some tulips in the house! Yours look wonderful. Thank you! They really brighten the place up! 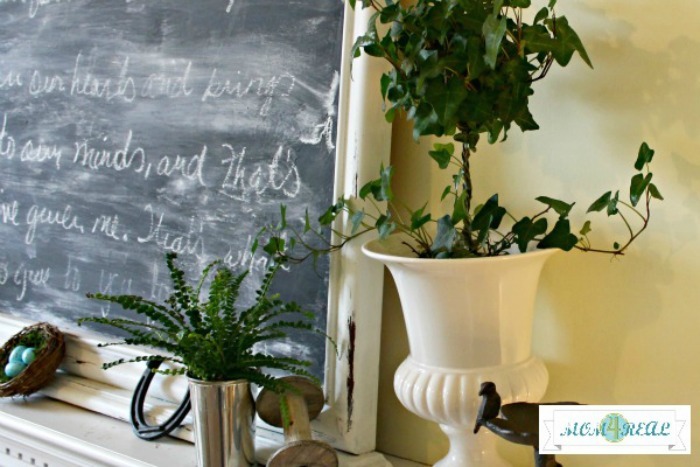 Fresh flowers and greens definitely help to brighten up the home! Yours looks so pretty in your variety of containers. Beautiful pops of green.. very spring indeed. So fresh in the white containers. The lemon button ferns, do they remain small? Sorry I am NOT versed in plant life… but I am trying :-) My home is bright and sunny and I have managed to keep 3 (huge)plants alive in the sun room over the last few years. So excited about that! But I would like to try my hand at smaller ones inside the rest of the home. My first time to visit and already found something we have in common. Flowers, I love floral anything………but fresh flowers are the bomb…………….and greenery too. I use both, silk and fresh……….they just add so much warmth and beauty to our homes., and don’t they just make your heart sing. Loved all your lovely pics, all so very pretty. Thank you so much, Nellie!!! I am so glad you came by today…flowers are one of my absolute favorites too! I am looking forward to getting outside and working in my garden in a couple of months…how about you? 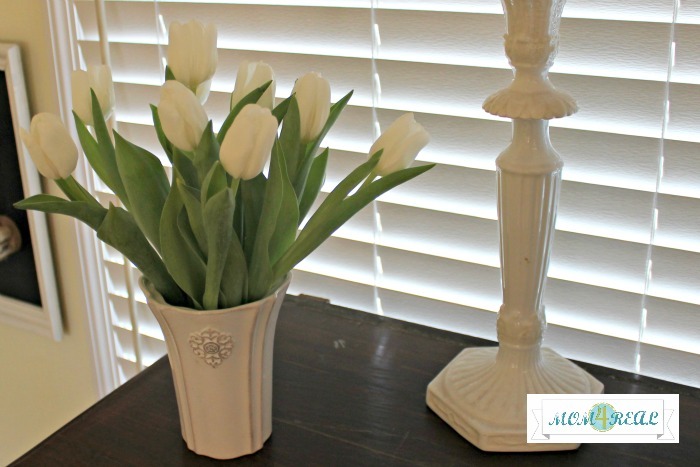 Love the tulips … and love that mint julep cup! Yes got to have fresh spring flowers! They do help getting through to the end of long dreaded winters! Flowers make a space sunny and happy! It’s amazing how much flowers and plants can add to a space. I love spring and the amounts of color they bring! You had me at tulips! Beautiful flowers. I love the ivy topiary and the fern too. I’m in need of some fresh flowers and greenery!!! I am with you, I love flowers. I don’t mind fake…but I generally do real because there is just something about them that I adore! 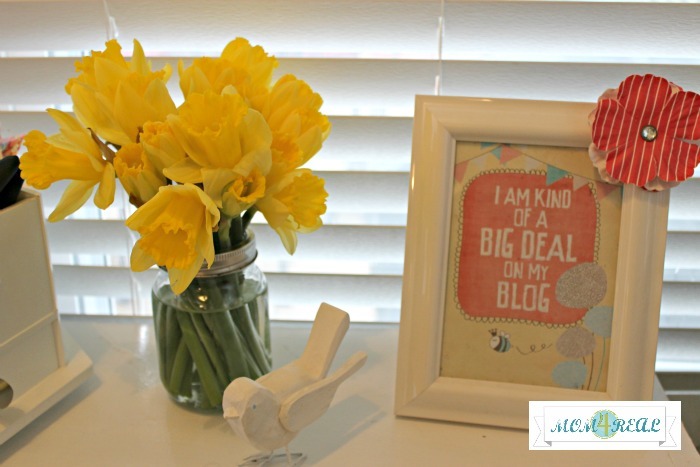 Did you make that printable that says “I am kinda a big deal on my blog”??? because that is awesome!! beautiful pix, too! Love that ivy too. You can’t buy ivy here anymore. It’s illegal! Travesty I tell you. 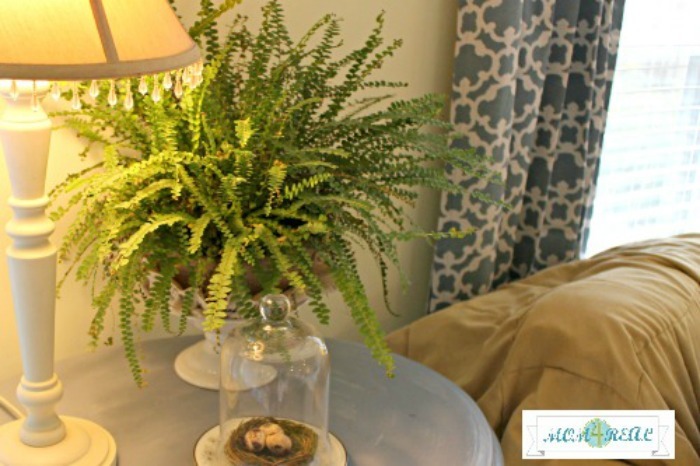 I love using real flowers to decorate indoors – it makes me feel like I am treating myself. The tulips are just gorgeous! They are something I don’t ever buy – but need to! Love daffodil’s too, but not in the house. Too loud of a smell for my sinuses. You have a lovely home. I hope you’ll come see My Daughter’s Master Bath Redo! #83 at Met Monday.